At the Movies | Daddy's in Charge? My kids love going to the movies. I remember when Tyler was two and my wife took him to his first movie, it was Barnyard. Every parent gets a little nervous about taking their kids to the movies for the first time. Are they going to sit still for that long? Are they going to be THAT kid and put up a fuss for the entire movie? Will that make you THAT parent that has to drag a kid kicking and screaming out of a crowded movie theater? Fortunately for us our kids have not been like that. We always arm them with the biggest tub of popcorn possible and make sure that we get free refills whenever we can. Of course I end up eating way more popcorn than I probably should, but we don't go to the movies everyday so I can justify it. We also throw in a little candy, so any possible meltdown happens AFTER the movie is over. The movie experience has evolved for us over the years. It used to be that we would only take the kids to animated features like Toy Story, Cars, and Cloudy With a Chance of Meatballs. Now the kids are into movies like Iron Man and Captain America. It really has made going to the movies that much more enjoyable for ALL of us. As much as the G rated movies are cute, sometimes you just need that thrilling action of the PG-13 ones. Now that they like going to those, I don't have to go to the movies by myself to get that fix. Now that the fall movie season is kicking off with the long awaited release of Cloudy With a Chance of Meatballs 2, to get us all in the mood, my friends at MovieTickets.com are giving away $50 in movie tickets and a DVD of the first Cloudy With a Chance of Meatballs. All you have to do is enter the giveaway below. Visit MovieTickets.com for tickets, trailers, and news on upcoming releases. 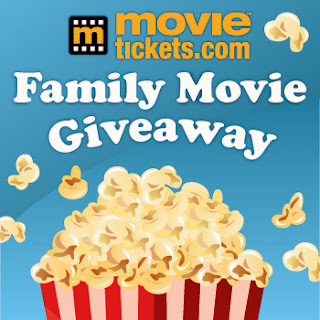 You can follow MovieTickets.com on Facebook and on Twitter. *Daddy's in Charge was compensated for this giveaway... not that I had an opinion, but all of them are my own unless my wife tells me otherwise. Do you take the winners kids to the movies, too? We're (me, GF, my 3, her 1) going to the premiere of Cloudy2 on Friday night! I can use movie tickets. Get away from the kids. We still haven't taken our kids out to see a movie. The whole "3 within 25 months" thing makes it tough. Love that I can enjoy "my movies" with my older son! We let the grandparents take the kids to see a movie first - and sadly, I don't remember which movie it was - but I think it didn't go all that well. We took our kids to see Wreck it Ralph. It was fun. The 2 year old fell asleep. The adults loved it! They saw chitty chitty bang bang! My boys are very afraid of the loudness in movie theaters, it's a real problem for us. We saw the most recent Muppet Movie but the trailers for upcoming movies were totally inappropriate. First movie (post-infancy) movie for my oldest son was Winnie the Pooh, at a drive-in. First one in a real theater was Mr. Popper's Penguins, I think. The popcorn buy is essential for young ones, no matter the price tag. I've been lucky with my kids so far -- four year old has seen about seven movies, my two year old only one. Near perfect behavior every time out. I know as a parent I should limit the amt of TV/movie time they get, and I do. But the look of joy and wonder on our boys' faces when they're grooving on a show or movie is pretty magical.